We recently visited two research foundations during our travels in the Western Ghats of India, SACON and MSSRF CAbC. SACON is the Salim Ali Centre for Ornithology and Natural History and MSSRF CAbC is the MS Swaminathan Community Agrobiodiversity Centre. Salim Ali was known as the father of Indian Ornithology. He took steps before his death to establish a national institution to work and study ornithology and nature conservation. Shortly after his death SACON came into being, with many of the initial scientists stationed at the base collaborators and students of Salim Ali. We had a chance to meet at least one person who worked with Salim Ali, Dr. S.Muralidharan, who is currently doing ecotoxicological work. In the end, the Ministry of Environment and Forest & Climate Change, Government of India (then known as Ministry of Environment & Forests (MoEF)) and the Bombay Natural History Society (BNHS) brought the dream of Salim Ali to fruition with the establishment of the center in 1990. SACON is located northwest of Coimbatore in Tamil Nadu. While there we met the director, Dr. Sankar, a well-known wildlife biologist who worked on Project Tiger for many years. Dr. P. Pramod gave us a very nice overview of the center and the work that is being done. He has been at SACON for many years heading up the Nature Education division, and has done research on bird communities in the Western Ghats. Dr. Muralidharan spoke about the work that helped save the Indian vulture (Gyps indicus), which is listed as critically endangered on the IUCN Red List. Indian vultures died of renal failure caused by diclofenac poisoning, a fact that was determined by scientists like Muralidharan at SACON. At MS Swaminathan Community Agrobiodiversity Centre we were given an overview of the centre from Mr. Gopalakrishnan, or Gopal as he’s called. Gopal is not a natural scientist, but applies his MBA experience to effectively market the products of small local farmers in the Western Ghats. 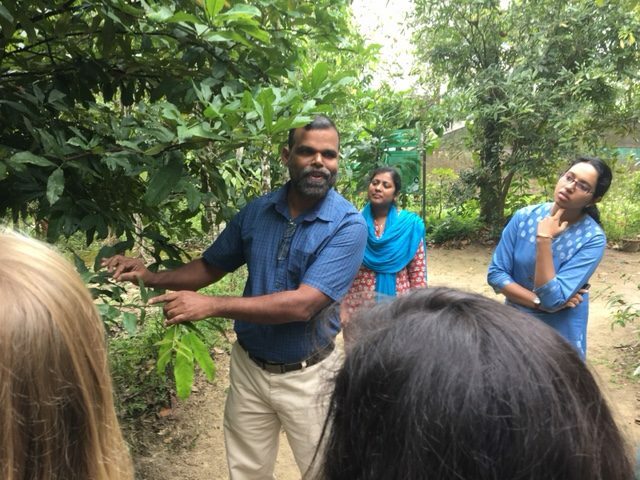 In fact, as he explained to us, MSSRF CAbC has a “4C” approach – Conservation, Cultivation, Consumption, and Commerce. They promote in situ (off and on farm) and ex situ (off and on farm and in communities) conservation by preserving plant genetic resources (crop varieties, wild edible plants, and rare, endemic & threatened (RET) species). They promote cultivation practices that merge principles of ecology and economics, using conservation-oriented farming practices. They integrate fairness and equity while working with local farming communities to maintain crop diversity to satisfy the multiple needs of food, medicine, and raw materials. They disseminate knowledge about the importance and value of crops/plants as one approach. Finally, they use market instruments to promote the first three C’s, especially exploring commercial or consumptive value of neglected and under-utilized crops and plants. We were then given a tour of the Botanical Garden (MSSBG as it’s called) by Dr. Sivan, a plant conservation biologist. 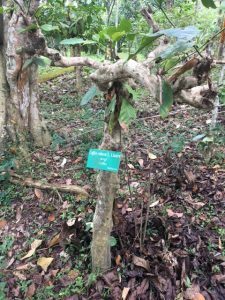 He took us mostly through the Medicinal Plant and RET (Rare, Endemic, and Threatened) gardens. Dr. Savin and colleagues showing us a medicinal plant at MSSRF CAbC. In fact, since 2003, Dr. Sivan has worked on medicinal plant conservation, cultivation and utilization at MSSRF. 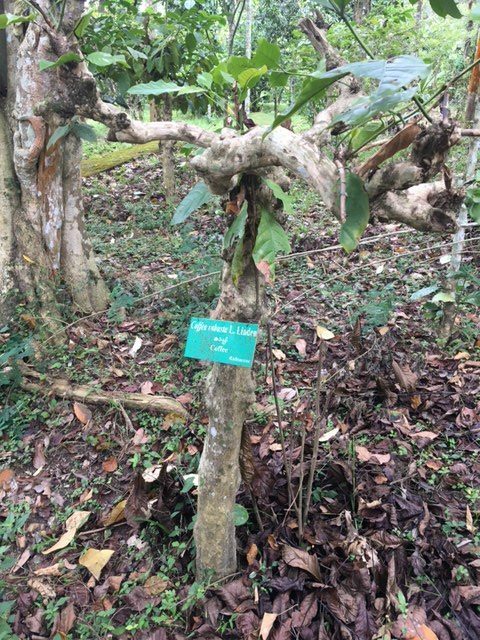 We saw many rare, endemic and medicinal plants, so many I cannot recall all of them. 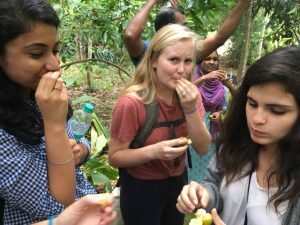 Of course, we saw cardamom, cinnammon, black pepper, coffee, a native citrus (which some of us ate), and much more. Manleen, Emma, and Reyna sampling wild citrus. 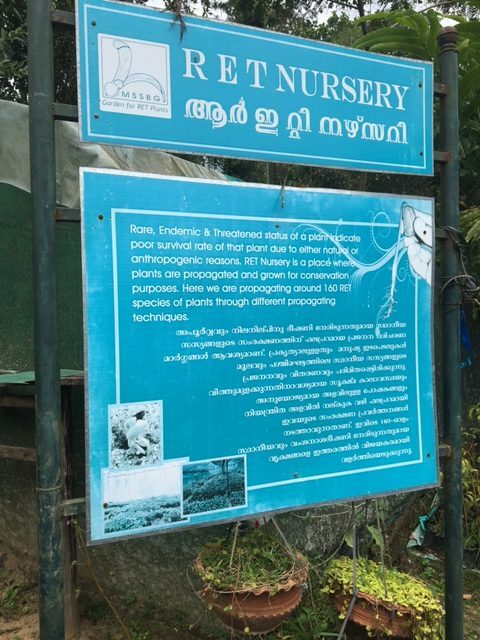 Their “greenhouses,” which are not glass houses but rather screened off structures, are used to rear many of these plants that are later transplanted on-site or to other areas in the Western Ghats (or elsewhere for that matter). The focus in these Indian Research Centres is usually applied, in these cases conservation of biodiversity, but also basic, fundamental knowledge on biodiversity of birds, plants, and other organisms. For instance, at MSSRF, conservation of plant biodiversity is accomplished through a utilitarian approach – we should preserve these plants because they often have medicinal uses.